So, yesterday we went into town to meet my friend Kate, she works in our neck of the woods once a month and has the morning free so it means we can get together for a good gossip and a mooch round the shops. For some reason though we have missed the last few meetings so we had a lot of catching up to do. We popped into Muji, I'm not such a big fan of Muji, I find a lot of their goods, bland for want of a better word BUT they have some really nice kids toys in there. A couple of years back I bought this balance game and it is still a favourite, I went back to get one for a friend but they don't stock them anymore :o(. They do have at the moment mini wooden city sets, I got the Kyoto one, which I think is a limited edition thing and yesterday I got the Paris set, so I now have enough pieces to put one or two in his advent stockings. 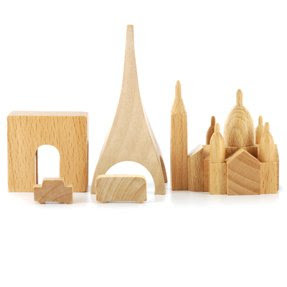 If you are looking for reasonably priced wooden toys, I recommend taking a look. I am trying to decide whether to get the math puzzles, they are for fractions and all wood, not for now but in a couple of years time, I just know that when Ebi-kun is ready to learn about fractions there will be no puzzles to be found! Well, after shopping and a nice lunch, Kate headed off to work and we headed home. We got in and had just about enough time to put up the birthday bunting and make a birthday card when our friends arrived. We did them a birthday 'tea' and they decorated their own muffins, there was a lot of running around and screaming, you know, the usual and YES it ended in tears. Ebi-kun landed flat on his face which resulted in another nose bleed. That said, he told me when everyone was gone that he didn't want anyone to leave because he was having so much fun, he was completely shattered and we didn't even have the pre-bath madness which is a nightly ritual. Every night, about 15 minutes before bath time he has to charge round like a loonie, it is like he is trying to use to any left over energy. All in all it was a good day and we all slept like logs. Today will be a day of tidying and sorting and I have to dig the Christmas decorations out, we have bought a new tree, a big one so we will need loads more decorations, it all looked a bit pathetic last year since we had a small tree and not much in the way of decs, enough for the small apartment but they looked a bit lost in here, I am hoping to fix that this year, I wonder if I can wait until the first to start putting things up? Those are cute toys, they'll make fun presents! Those little cities are great! It would be hard to just buy one set. I'd have to get them all. Have fun with your decorating too!